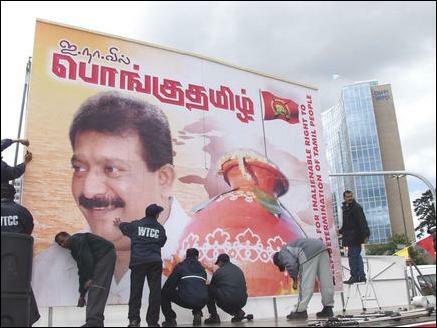 Pictures of Tamil Eelam national leader, Mr. V. Pirapaharan, were carried at the front, followed by a procession carrying Tamil Eelam national flags, with Nathaswaram and drum music. The Tamil Eelam women’s wing, Education wing, and the organizers of the Pongu Thamil event were in the procession, followed by the Tamil Eelam students organization. 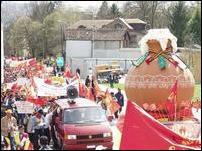 A large number of people from many countries are converging in the procession from all directions. 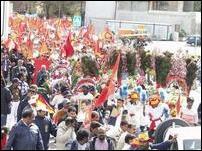 The procession from the Central train station will reach the United Nations building 2 k.m. away in about 60-75 minutes. The following is the full text of the Press statement released by the International Federation of Tamils regarding the Pongu Thamil event. 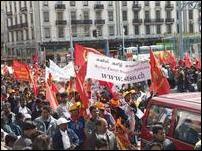 Today's 12,000 strong massive convergence of Tamils of the island of Sri Lanka in Geneva for their International Pongu Thamil (Tamil Resurgence) from various parts of Europe, from far away places like Rome, Oslo, Copenhagen, Stockholm, Berlin, Amsterdam, Brusselles and Paris is to echo the near unanimous voice of millions of Tamils at home expressed in the series of Pongu Thamil held all over Thamil Eelam and in the recently concluded Parliamentary Elections of Sri Lanka. Pongu Thamil is the movement initiated by the Youth of the Jaffna University to raise national unity and consciousness among the Tamils and to reclaim the houses and, lands occupied unjustly by the State Forces. 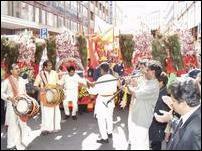 It was conducted in all the districts of the Northeast (Thamil Eelam) of Sri Lanka as a festival of Tamil nationalism. Once before in 1977 the Tamils spoke almost unanimously through the parliamentary elections their wish to become a separate state but their participation in Parliament was rejected. After decades of war and denial of rights, the Tamils have again participated fully in the elections under the leadership of the LTTE and are knocking at the doors of democracy and human rights to recognise and respond to the unanimous verdict of the people. b)	the one aspiration of the Tamils is their right of self determination to be a distinct people with their traditional homeland be recognised. The results of the recent parliamentary elections have shown clearly the reawakening of forces which have campaigned against the two years long peace process facilitated by Norway and have brought to power SInhala Buddhist Nationalists who want peace and prosperity for themselves but not a just and peaceful solution that will stabilise the whole country and take it towards peace and prosperity, We have genuine fears about the future. Hence we appeal to the international community and the UN Commission on Human Rights to exert their pressure on the Sri Lankan government to respect the unanimous verdict of the Tamil people an genuinely seek a just and peaceful solution.